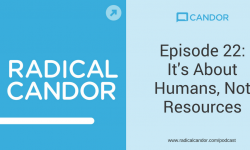 This is the last episode of the first season of Radical Candor! Kim and Russ start off with some stories about feedback systems they’ve seen work for encouraging feedback among peers. Kim shares two systems that worked well for peer-to-peer praise and appreciation at Google. Russ shares a story about receiving criticism from peers that helped him make a change that impacted his possible career trajectory at Google. Given the purpose of praise and criticism, Kim and Russ argue that peer feedback is extremely important and impactful. The more feedback between people on a team, the more success that team is likely to have. 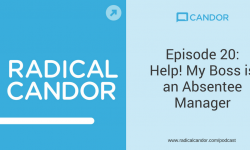 This episode includes a listener question about peer feedback gone wrong. A listener wrote in to describe a situation when she had an issue with a peer, escalated to the boss, and got a terrible reaction from her peer — the situation led to a huge rift in the relationship. Kim and Russ provide their advice, describing a clean escalation process from Fred Kofman. If you are talking about someone and not to someone, you are operating in Manipulative Insincerity. In addition to their advice on how to handle these escalations well, Kim and Russ also talk about what to do to resolve a situation that has already gone wrong. Tip 1: Start by asking for feedback. Tip 2: Focus on the good stuff. Tip 4: Don’t make it about personality. To hear more about these tips, listen to the episode and check out the resources below. Join us for a Twitter Chat to discuss this episode as well as the rest of the season. We’ll be kicking the chat off on Friday, 6/9 at 12pm Pacific. Find us at #CandorChat and join in! We’ll be asking these questions to get the discussion started, but feel free to bring your own questions and stories! Have you ever received impactful feedback from a peer? Have you ever given feedback to a peer and had it go wrong? Does your company have any systems in place to encourage peer feedback? What has been your favorite episode of Radical Candor? What are your current biggest challenges, either as a boss or with your boss? We’ve got lots more to say about giving feedback and encouraging it between peers. Check out these articles, and explore our blog for more! As we mentioned in this episode, we’re taking a break from the podcast to focus on building software that will help you put the ideas behind Radical Candor into practice. You can download the Candor Coach iOS app from the App Store now, and stay connected through our email newsletter and social media to get updates about the new products we release. 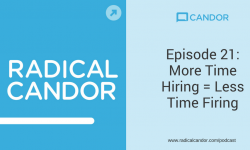 This is the last episode of season 1 of Radical Candor. Thank you for listening and helping to spread the word! You can revisit past episodes on Apple Podcasts, Stitcher, or wherever you get your podcasts. Subscribe there and sign up below to get an email alert when we’re coming back for season 2.